When Pete Ricepudding was only a child, people told him that he and everybody else had a guardian angel. And he learned the little prayer about it: "Angel of God, who art my guardian, because the goodness of God has committed me to your charge, enlighten and guard me, lead and direct me. Amen." Ever since he had been wondering what concrete things this angel was doing for him. A few years ago, he had a bicycle holiday in France. When descending from the top of a bluff hill, he fell from his bicycle in a sudden flexion of the road. If he would have managed to stay on his bicycle, he would have tumbled into a ravine after a new flexion. So he thanked his guardian angel and gave him the name Armando. But after this incident he had severe galls, and his gratitude was not very deep. In a comic book, Pete saw a dog next a broken bottle of wine. A little devil was encouraging the dog to drink the wine, and a little angel was warning that he should not do that. Perhaps it was the task of a guardian angel to preserve the pupil from evil. Pete Ricepudding once participated in an eight hundred meters running-match. Some participants run a shorter path, and Pete himself decided to deviate from the laid down route and was an unmerited seventh in the ranking. But why did his guardian angel nothing to stop him? One beautiful summer day in September, Pete had been wandering across the fields. He thought that the angel could have the task to show him how beautiful the creation of God was. But in the evening he watched the news on tv, and learned that a mad Palistinian, disguised as an orthodox Jew, blew up a full city bus in Tel Aviv. Why did his guardian angel, Armando, allow him to see that news on tv? Pete and his angel chose a day in spring and a point of time at which they would meet each other next a certain cavern in Pete's hometown. 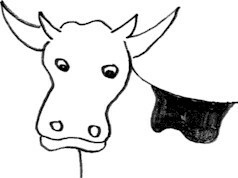 Pete stood waiting there, expecting the apparition of the angel, but at the chosen moment a cow showed up on the horizon. That wasn't the angel, was it? To be certain, Pete addressed the beast, but she only said "BOOO!" and "BOOO!" again. At the final end, when Pete was not very young any more, he suddenly learned what the angel did for him. He stood next his book-case and watched the books he read during his lifetime up to then. "The little shepherds of Fatima who saw Virgin Mary", was one of the titles, and "On the immortality of the soul" by father James Little S.J. was another. And "The life and deeds of the holy vicar of Ars". Now he understood that the angels are there to remind us ... that our final destination is heaven.